Hello, and welcome to another con review from the Pacific Northwest! That’s right: Sakura-Con has come and gone once again, but this year was an extra-special occasion. 2017 marks the 20th anniversary of the convention since its debut in 1997 as Baka-Con. Back then, it only consisted of a few hundred people bringing traded VHS fansub tapes and TVs into hotel rooms to watch anime and hang out, but it’s certainly come a long way from there. This year’s guests were very impressive, with some brand-new faces as well as some favorite guests returning for another year. Without further ado, let’s get into the thick of it, since I have a lot of ground to cover! One of the major events that went down at Sakura-Con this year was the English-dub premiere of Blue Exorcist: Kyoto Saga, hosted by Aniplex. This is the second adaptation of Blue Exorcist (Ao no Exorcist), and it is a much more faithful adaptation of the manga than the previous series. Fans of the series will be impressed and pleased with this new addition. 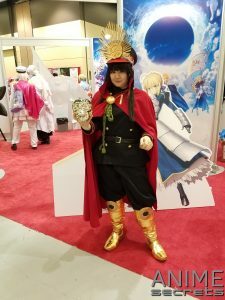 The convention also hosted a special autograph session with English voice cast members Kira Buckland, Johnny Yong Bosch, and Christine Marie Cabanos at the Aniplex booth, as well as a few other panels featuring the cast. Other than these events, there were also some old favorites of mine, like the Bad Fanfic and K-Pop panels. In my opinion, this year’s most impressive feature was definitely the panel lineup. I even got to see my two favorite panels on the first day! The first one featured Hiroshi Nagahama, the director of various famous anime such as Mushishi and Detroit Metal City, which are two of my top favorites. He hosted a fascinating panel on his personal love for American superhero comics, and he brought in some of his favorite issues to show particular aspects that he appreciated. Nagahama said that when he was younger, he liked American comics so much because they were illustrated with more detail than most manga. In particular, he mentioned that these comics had fully detailed faces, dynamic poses, and scenery, which created more striking imagery. Artists such as Stan Lee and Jack Kirby made strong impressions on Nagahama. He even said that the episodic nature of story arcs in western comics influenced the way he worked on his anime. This is most noticeable in Mushishi, in which you not only see the story of the protagonist, but if you were to watch the episodes out of order, you would also see self-contained events throughout his adventures. The panel culminated in Nagahama talking about his new project, a superhero-themed anime called The Reflection that he’s working on with Stan Lee. I was thrilled to hear about it, and I cannot wait to see how the series turns out with such a talented team working on it. All in all, the panel was a lot of fun, and it was very cool to see a director I like showing such passion for the comics I grew up with and loved as a kid. Another interesting panel I attended was about Thunderbolt Fantasy, a show that combines anime aesthetic with Taiwanese glove puppetry, known as budaixi. The result is a very fun and different form of media that is striking and visually impressive. The panel featured series creator Gen Urobuchi himself, as well as others who worked with him to create the show. First, the panelists went over a brief history of budaixi and how it’s changed over the years, then they went into the various aspects of how Urobuchi worked with the other companies involved in the show. Liang-Hsun Huang was one of the driving forces behind both Thunderbolt Fantasy and the software company Nitroplus, which handled the character design, and renowned figure producer Good Smile Company helped to create the puppets. With that, an exciting new series was born! For those who haven’t seen it, I definitely recommend it. You can find it on Crunchyroll, and it’s a great choice if you want to take a chance on something that you haven’t seen before. Speaking of Crunchyroll, they were a major player at Sakura-Con, hosting an industry panel with new announcements for what’s coming in 2017, as well as a panel on working in the anime industry. There was also a meet-and-greet on day two, where I got to see the faces of the Crunchyroll YouTube channel. They were some of the nicest people I’ve ever met, and it was great to see the people who work for such a fantastic company and realize that they’re fans just like the rest of us. It shows that the face of the anime industry has changed a lot over the years. The staff of these companies has gotten younger and more in-touch with modern demographics, which demonstrates that they’re paying attention to who’s watching anime, reading manga, and enjoying the hobby. Overall, I was pleased with Sakura-Con 2017. They did a very good job with what they had going. I especially liked the Thunderbolt Fantasy and budaixi panel, just because it’s a new and exciting subject that you never really hear about in the US. The convention also did nice work to streamline and enhance the exhibitor’s hall and artist alley experience. 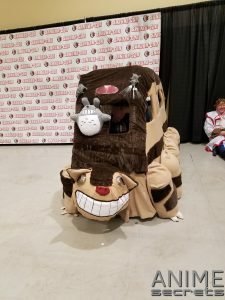 Sakura-Con has again proven that they’re able to keep up with the changing times and keep content fresh. They continue to book exciting guests and produce solid panels that keep people interested in the latest and greatest in the anime world. At the rate they’re going, I’m certainly returning next year!